After years of designing, switching factories, and many other difficulties, here are the first grips from Sensus. Featuring a super soft compound and simple, yet incredibly sufficient design made right here in America. Cut lines for easy chopping of either flange completely, or just partial for shifters. Lock-On system for clamping on your hanger reliable and secure thanks to the aluminum collar clamps provided. 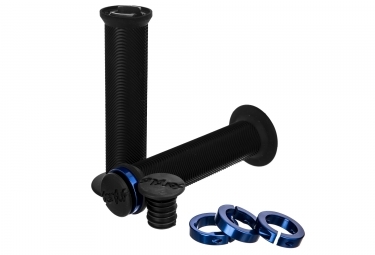 *Comes with extremely safe and durable Kraton Rubber bar ends that match up absolutely perfect with the outer flange.